I am a graduate student and a teaching associate in the English department. My interests are within a 19th century American context where I study poetic conceptions of nature, citizenship and empire among other things. While my academic interests and research informs my writing, my poetry is tethered to my childhood in East New York, Brooklyn as well as to metaphysical questions regarding attachment, family, time and space. After our Park Row tour this afternoon, I began thinking about how often fires consumed publishing sites during the midcentury and how this ordeal was a major concern for editors, writers, and subscribers. I know from my research on Robert E. Bonner’s New York Ledger that the building housing the Ledger on 48 Ann St. burned down in 1860, taking with it a number of letters and manuscripts only five years after the paper’s debut. 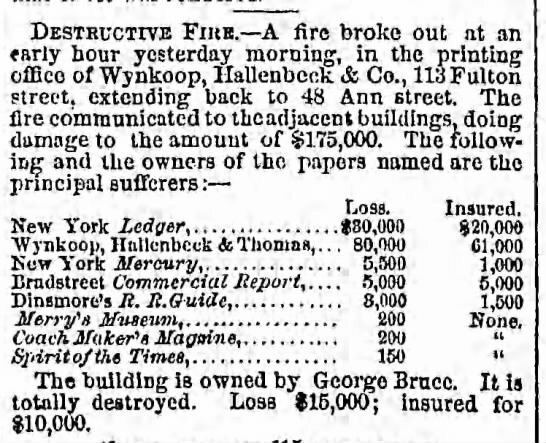 The Brooklyn Daily Eagle provided a list of the “principal sufferers” affected by the fire (see figure 1). The story was also covered by The Times (see figure 2). 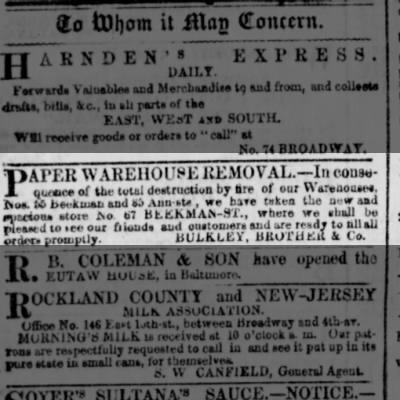 I found another example in the January 4, 1860 issue of The Tribune, a short blurb about a fire that consumed a “Paper Warehouse Removal” company owned by Buckley, Brother & Co. (see figure 3). Although these are just a couple of examples, such fires were very common and many publishing houses were anxious about losing their businesses to fires, an anxiety insurance agencies and contractors capitalized on. 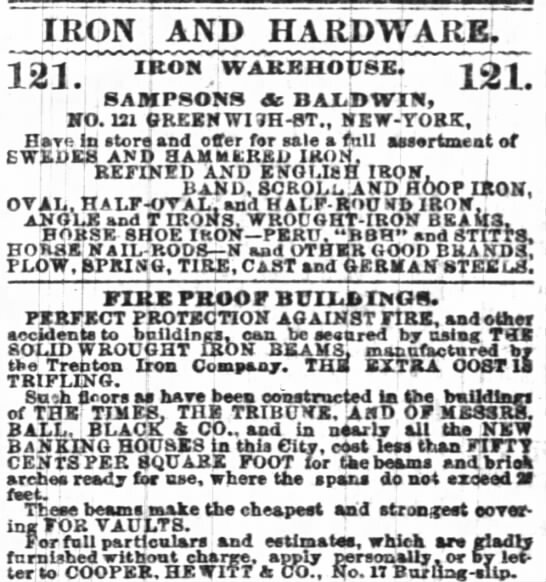 For example, in the April 11, 1860 issue of The Times an advertisement appeared for iron and hardware (see figure 4). The company maintains that their iron is fireproof and the same type used to build the structures housing The Times, The Tribune, as well a number of banks in the city. This ad’s audience is clearly the publishing houses. It’s interesting to learn that these fires generated so much business in New York City.